Chesnok Red is one of our favorite heirloom garlics. One reason: It's great for all-around use in the kitchen. This hardneck heirloom variety adds a rich but not overpowering garlic flavor to eggs, seafood, soups, stews and meats. When roasted, Chesnok Red turns garlicky-sweet. Chesnok Red also has good disease resistance, which makes it a garlic grower's dream to grow. Produces medium to extra-large bulbs in good growing conditions. About 45-60 cloves per pound. 1 pound should yield 4-7 pounds of bulbs at harvest, depending on growing conditions. Stores about 6 months in a cool, dry place. Georgian Crystal produces one of the highest levels of allicin when crushed. Allicin, by the way, gives garlic its potent health benefits. Georgian Crystal grows vigorously, with cloves that can be as thick as your thumb. Those qualities make Georgian Crystal easy to plant and easy to work with in the kitchen. Produces medium to extra large bulbs in good growing conditions. About 50 cloves per pound. Khabar--a rich, mild garlic. Eaten raw, Khabar has some initial heat--then it mellows out nicely. It won't burn out your taste buds like some garlics can. Khabar's mild flavor when cooked makes it a favorite among chefs for mashed potatoes. Khabar was originally found in Siberia, so it can handle frigid temperatures as well as our milder zone 7a winters. It's a vigorous grower with good disease resistance. Marbled purple stripe hardneck variety. Produces medium to extra-large bulbs.in good growing conditions. Stores about 6-7 months in a cool, dry place. Music is the most popular heirloom garlic we grow. In good growing conditions, Music can produce big bulbs with fat, easy-to-peel cloves. Music's hot if you eat it raw. But when cooked, Music gives dishes an earthy garlic flavor gourmet chefs covet. (We know one well-known restaurant in Louisville that uses Music almost exclusively for its dishes.) It's also a great garlic to grow, with sturdy, disease-resistant plants. 1 pound should yield 4-7 pounds of bulbs at harvests. Stores about 7-9 months in a cool, dry place. Red Toch's a softneck garlic with a mild, creamy flavor, which makes it perfect for mashed potatoes or other dishes where you want garlic that won't overpower. It's a relatively new heirloom garlic for us, but we like it. A lot. About 60-70 cloves per pound. 1 pound should yield 5-10 pounds of bulbs at harvest, depending on growing conditions. Stores about 6 months in a cool, dry space. Rosewood's one of the hottest garlic varieties on the planet. It's a must have for people who love spicy-hot taste sensations. Raw, Rosewood will light your mouth on fire. But cook it, and you'll discover a warm, spicy flavor added to dishes. Small bulbs in 2014 due to a harsh winter, so you'll get more per pound. Bulbs are normally medium to large sized in good growing conditions. 1 pound should yield 4-7 pounds at harvest, depending on growing conditions. Stores about 7-8 months in a cool, drive space. Click here to jTibetan is a very hard-to-find heirloom garlic in the United States. If you're an heirloom garlic seed collector, you definitely want this variety in your garden. Tibetan's known for its fiery taste when eaten raw. It should mellow, like most spicy garlic varieties, when cooked. Red Grain is another hard-to-find purple stripe heirloom variety we grew on a trial basis for 2015. It grew so well have enough to share this year. A great one for heirloom plant collectors. This is a new variety for us, so we have limited information on it. But so far, we like what we see. Difficult to find in the U.S.
Our Spicy Sampler, for those who love it hot. The garlic varieties in our Spicy Sampler will definitely add a kick to guacamole or any other dishes where you'd like some spice. Eaten raw, these heirloom garlic bulbs will pack heat. Bulbs will be suitable for growing and eating. Bulbs will be labeled by variety. You will receive at 2-4 different varieties. Spicy heirloom garlic varieties grown for 2014 include Rosewood, Tibetan, Korean Red, Susan Delafield, Morado Giant, and Russian Red. Our Mild Sampler garlic varieties, great for eating raw or cooking in dishes where you want mild garlic flavor. Garlic varieties in our Mild Sampler work in dishes where you want garlic, but you don't want the flavor to overpower the dish. Seafood, fish, and garlic-mashed potatoes all work beautifully with mild garlic. Mild garlic also works well for those who eat raw garlic daily for its health benefits. Bulbs will be suitable for planting and eating. You will receive 2-4 different varieties. 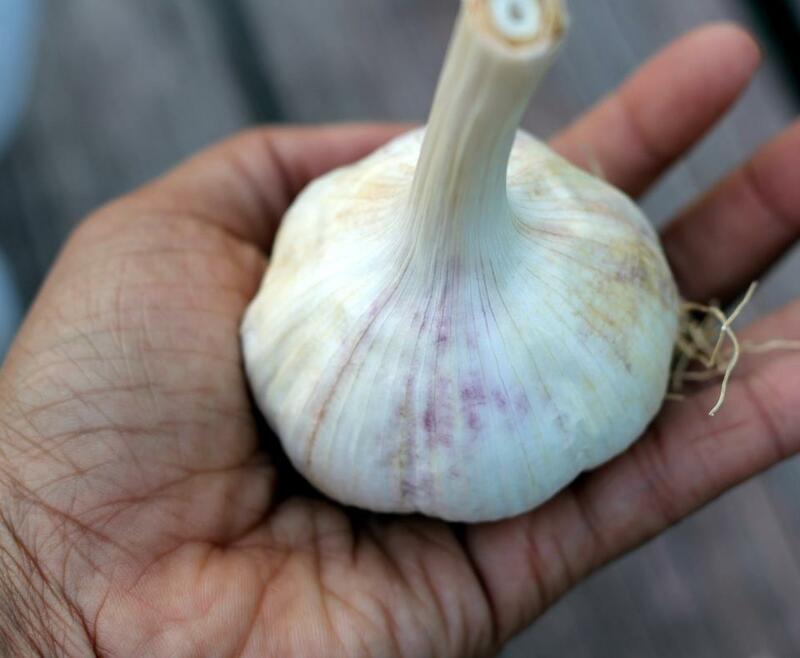 Mild heirloom garlic varieties grown for 2014 include Khabar and Red Toch. The heirloom garlic varieties in our Robust Sampler work well in hearty, everyday dishes where you need garlic. They also work well with soups, meats, or wild game. Robust heirloom garlic grown for 2014 includes Music, Chesnok Red, Georgian Crystal, and Tuscan. If you love roasted garlic, you'll love eating and growing the garlic varieties in our Roasted Bulbs sampler pack. Roasting brings out their caramelized, spicy-sweet goodness. 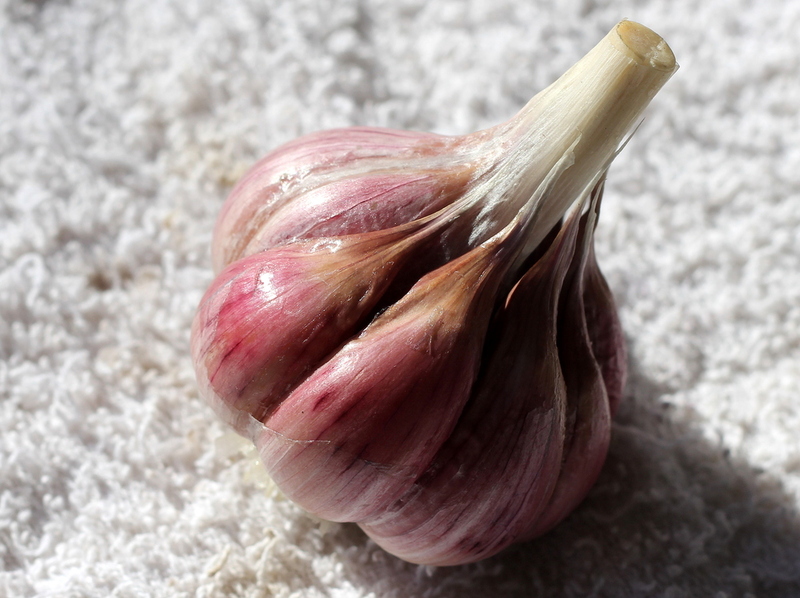 Roasted heirloom garlic varieties grown for 2014 include Chesnok Red, Russian Red and Georgian Crystal. 1 pound should yield 4-7 pounds of bulbs at harvest in good growing conditions.